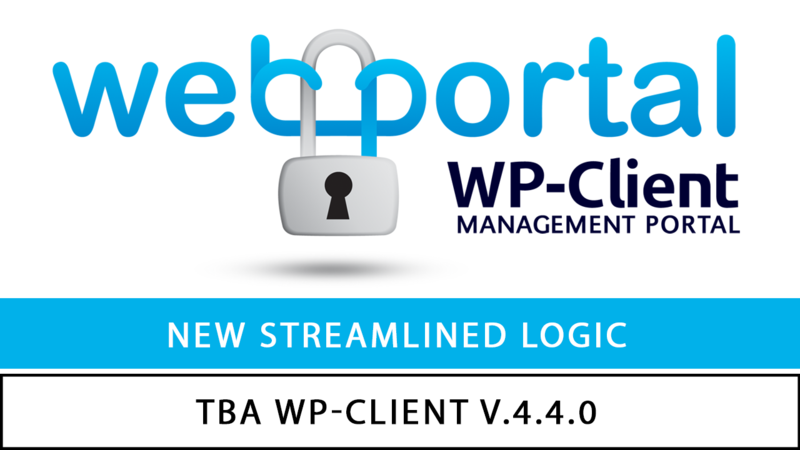 We are happy to announce that in response to feedback from our many loyal customers, we have made some important changes to WP-Client as of v.4.4.0. This update aims to streamline the workflow of the plugin, as well as improve integration with external plugins/tools, such as Visual Composer, WPML, Divi and others. We will first be releasing v.4.4.0 in Beta in the coming days, which will allow our customers to test these changes on staging/development sites before updating in live production environments. You can read more about the changes, their advantages and your required actions after updating below. The first major change is related to the URLs that are generated for Portal Pages. We have removed the ability to select a WordPress Page as the “Portal Page” in Theme Link Page Settings. Instead, you now how the option to simply define a Portal Slug, which can be any Permalink URL slug of your choosing, and will apply to all Portal Pages in your installation. With this change comes many distinct advantages, including compatibility with content builder tools/plugins such as Visual Composer, Divi and other similar themes, as well as compatibility with multi-lingual plugins such as WPML. No specific actions are required on your part after updating the plugin for this change to take effect. The second major change is in relation to HUB Pages and HUB Templates. In previous versions of WP-Client, a “HUB Page” WordPress page (the Theme Link Page) was used both for HUB Page URL generation, as well as for displaying the HUB Page to the client. The clients’ HUB Pages were created automatically once the clients were added / registered, and the content of these pages was taken from HUB Content (WP-Client > Templates > HUB Content), where a shortcode was contained by default in order to display HUB Page Template content to the assigned client(s). These HUB Page Templates contained content for clients and could be assigned to certain clients and / or Circles. As a result, several steps and functions were needed in order to display the content of a HUB Page Template to clients. We have significantly improved and streamlined this previous structure and logic, and now the HUB Page URL slug is controlled by a HUB Slug in settings, instead of the previous Theme Link Page for the HUB Page. Additionally, we have also added HUBs, which work essentially as previous HUB Templates (they can be filled with content, and assigned to certain clients and / or Circles). New clients will see the Default HUB if not assigned to any specific HUB. With this new logic, we have essentially removed the requirement of having separate “HUB Pages” and “HUB Page Template”, and have essentially combined them into one element: HUBs. With these changes come a number of advantages, including compatibility with content builder tools/plugins such as Visual Composer, Divi and other similar themes, as well as compatibility with multi-lingual plugins such as WPML. IMPORTANT: After updating to WP-Client v.4.4.0, all previous HUB Pages and HUB Templates will be automatically transformed into new HUBs, and everything should work with no issues (we have exhaustively tested this on our servers, and we plan to release a Beta of this functionality first as well). However, after updating, you will want to verify that no data is lost and your clients can see the needed information on their HUBs after they login. The last major change coming in v.4.4.0 is in relation to Shortcode Templates. As of the newest version, Shortcode Templates will be going from SMARTY (.tpl) format, to PHP format (.php). Additionally, customized/edited templates will be stored in your theme folder, which will allow you to edit them not only via the WP-Client admin dashboard menu, but also via FTP using your code editors (similar to how many other plugins accomplish this, such as WooCommerce). The main advantage to this change is that the code inside of the Shortcode Templates will be easier to understand and customize. Even those who are not familiar with HTML and PHP code will have an easier time finding and editing or adding text strings. IMPORTANT: If you have not made any changes to your Shortcode Templates (meaning you are still using the default content), you will not need to take any special action before or after updating. However if you have customized/edited some Shortcode Templates, please note that any of your changes will not be applied after updating, and you will need to make your changes again in the new templates. We apologize for this inconvenience, but unfortunately the old templates cannot be transferred over into new format because their structure and code are significantly different.